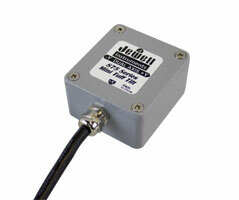 Jewell Instruments: The 875 Mini Tuff Tilt Series is the newest addition to Jewell’s tiltmeter (inclinometer) line for geophysical & geotechnical applications. This is an affordable and durable tilt solution in a miniaturized package to accommodate space constraints. Prices are as low as $300 per unit on quantities of ten or more. The 875 Tuff Tilt series contains MEMS technology and is available in uniaxial and biaxial models. ±5°, ±15° and ±30° measuring ranges are available with a 0.05° resolution and 0.5-4.5 V, 4-20mA and digital RS485 outputs. This serves as a great solution to many industrial and geotechnical applications. It is useful for structural monitoring, angle measurement and control, platform leveling, testing and research, OEM and more.